Yes, you heard me right – you lose weight even after you finish the diet. In order to keep losing, you need to follow the 4 Day Off the Military diet plan, which is a typical 1500 calorie diet plan. More on this plan in my next post. It’s not clear how the military are involved in inventing this diet, or why it is called that way (may be there is a shortage in diet naming, who knows…; but there is one thing I am quite sure about – you will like it. What will you like best about the Military Diet plan? It’s no secret that many weight loss diet plans are way too complicated. Some of them require you to be nearly a professional nutritionist to understand all the aspects of the diet plan. Unlike these, I mentioned above, the Military diet plan is very simple, short, easy and effective, which in fact is all you seach for when you need to lose a few pounds quickly. The grocery list for the Military diet plan menu is quite simple and won’t hurt you family budget at all. These are ingredients you can get at any grocery shop on the way back home. The Military diet is for people with strong will-power. It’s very low calorie diet and strictly regimented, which makes it quite restrictive. However, it is completely bearable as you follow it only for 3 days. The rest 4 days you eat less strictly. 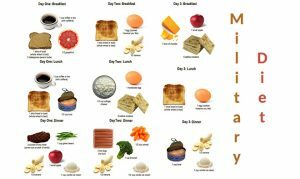 So when need to be ready for the beach or if you have a social event to attend by the end of the week, the military diet is the best way to start your week. The Military Diet is so tempting and keeps attracting more and more ardent followers. That’s not surprising at all, knowing the the results you may get. Highly motivated people, who have enough strong will power and a very small amount of time to lose a few extra pounds. The diet lasts three days only and most likely you will feel hungry, but with enough motivation and strong will-power you will get awesome results. I assure you – your weight loss results will be so amazing, that you will feel your efforts totally worthed. People who don’t have much time shopping and preparing sophisticated diet food. But as I already mentioned above, the grocery list for the Military diet is limited to any grocery shop you enter on your way back home and won’t hurt you family budget at all. People who prefer fad diets to slow and steady weight loss diets. You will appreciate the Military diet for its simplicity and the absence of choice, which believe me is a good thing sometimes. Unlike many diets, which give you plenty of choices and decisions to make, the Military Diet, as the name suggests, is straight to the point. You simply eat what you are told to eat each day for breakfast, lunch and dinner and don’t have to spend time planning menus or learning recipes and preparation techniques.